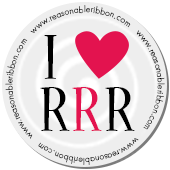 Welcome back to my Saturday's posting for The Rubber Buggy on-line store. Hi, Nancy Hill, and excited to share a three fold card with a packet of petunia seeds. I have many friends in garden clubs who would love a special card with a packet of petunia seeds for this potting this year. Enclosed in the center of this card is a packet of petunia seeds. Card measures 6” x 6”. Cut two 6” x 12” pink card stock for the main frame and score in the center of each frame. Adhere two sections together to form three pages. 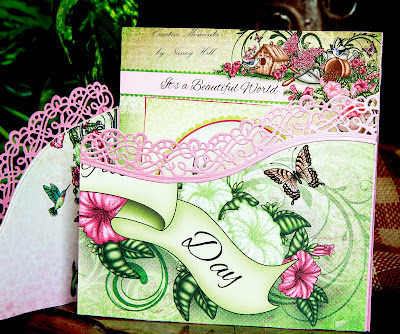 Use the pink paper to cut two Heartfelt Creations Fleur Border Basic dies. First Page: Cut the patterned paper 4” x 6”. Use the 7” x 1.75” plain border die to cut the patterned papers for the front of the first page and pink main frame for this page. Place the plain border die on the left side at 4 ½” and ends on the left at ¼”. Use the other plain border die to cut the patterned paper for the back of this page. Adhere the front page to the pink main frame. 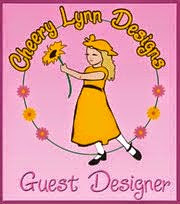 Adhere one pink HC Fleur Border die as shown on the photo of the card. Adhere the back of the patterned paper to the pink main frame of this first page. Second Page: Repeat the same instructions for the first page except place the plain border on the right side at 4 ½” and ends on the left side at 3 ¼”. Inside of Card: Cut out two 6” x 6” pictures and 4 ½” x 4 ½” pictures found in the Heartfelt Creations Classic Petunia Paper. Adhere the 6” picture to the pink main frame. Glue only the top and bottom of the 4 ½” picture. You might want to place your packet of seeds on the back of the picture and then add glue to the top and bottom to make sure your packet will be able to slide out then the glue dries. Butterfly: Stamp the butterfly with black embossing powder on the pink card stock. Color it with colored pencils or Copic markers. Adhere to card. Using the instructions of making these petunias as shown below and adhere the white artificial flower stamens. Add the leaves to the flowers and adhere to the card. Add NUVO Crystal Drops to part of the leaves. 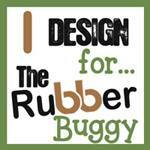 The Rubber Buggy Design Team has something new to share with you each day. Pop in and see for yourself what is being shared by this talented group of inspiring designers! !